This, dear readers, is one of my very favorite things. It’s the food52 winner for Your Best Spinach Recipe, and it is the most delicious spinach dip ever. If it were humanly possible I would swallow the whole bowl like a snake ingesting an egg. I always serve this dip with homemade pita chips (recipe follows). These are super simple, and way better than the store-bought variety, but the success is contingent on your starting with good fresh pita bread. Austinites- I use the small rounds of Phoenicia white pita, which is available at good ole Central Market. Fill a large pot with water and bring to a boil. Add a generous amount of salt, and then the baby spinach. Boil for about a minute, until the spinach has completely wilted but is still bright green. Drain well, and allow the spinach to cool slightly. Put the cooled spinach in a kitchen towel and squeeze as much of the water out as possible. Chop fine. Return the now empty pot to the stove and set the heat to medium. Saute half of your minced garlic in 2 tbsp olive oil and add the spinach. Add a pinch of salt. Stir for a minute or two. Remove from the heat, allow to cool. In a large shallow bowl, mix the yogurt, the remaining minced garlic, and the sauteed spinach until well combined. Add salt to taste. 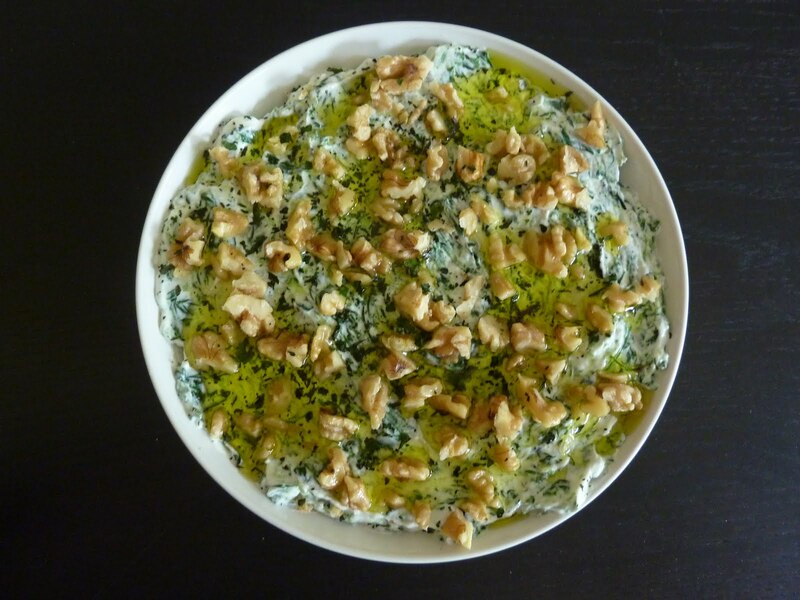 Sprinkle with dried mint, crushed walnuts, and a drizzle of good olive oil. Serve with pita chips. Cut each pita round into six wedges, and peel apart the two layers, creating 12 wedges from one pita round. Repeat for as many wedges as you can fit on your baking sheet in a single layer (I usually do two pitas at a time). Toss the pita wedges with olive oil, and arrange in a single layer on the baking sheet. Sprinkle with kosher salt and pepper. Bake for 5-7 minutes, or until the chips are mostly golden and crispy. I do admit I didn't use walnuts or mint (I more or less forgot to pick them up), though I think even beyond that it might've needed…something. Lemon juice? Artichokes? Will have to experiment.